Wilber’s is one of the biggest names in barbecue in eastern North Carolina. Unlike a few other famous places in the Coastal Plain, this is a restaurant where the name above the door still means exactly what it did when Wilber Shirley bought the former Hill’s Barbecue and opened it under his own name in 1962. There are larger barbecue operations if you count catering and wholesale distribution. 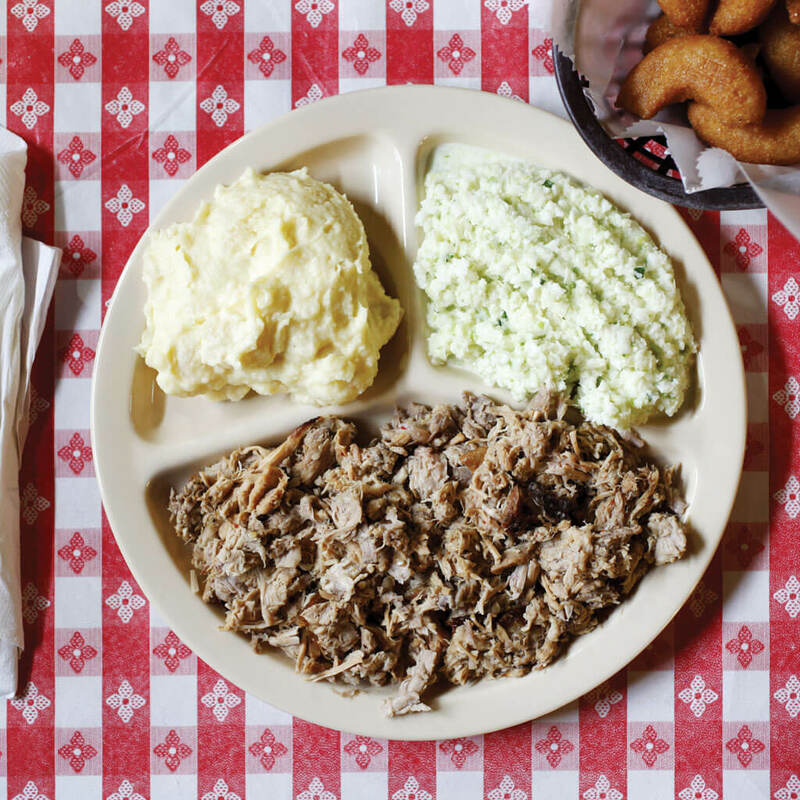 But few, if any, barbecue restaurants in North Carolina serve more customers than Wilber’s. And he not only manages to prepare his barbecue the old-fashioned way, he does it without making a big fuss about it. The fact that his staff cooks up to 130 entire pigs on a busy Labor Day weekend hasn’t caused him to start looking anxiously into electric or gas cookers. For that reason alone, lovers of real pit-cooked barbecue ought to stop by his place and shake his hand. Wilber says that salesmen have tried to sell him electric- or gas-fired pits. He jokes that he tells them that not only will he not buy one, but to please park their display models around back during their sales call, so his customers won’t see them and get the wrong idea. Being well situated sure doesn’t hurt in the barbecue business either. U.S. Highway 70, which passes directly in front of Wilber’s place east of Goldsboro, is usually clogged with day traffic between Raleigh and Kinston. Perhaps more important, it’s also one of the three main routes to the ocean in North Carolina. Nearly everyone from the mountains, the western Piedmont, the Triad, and the Triangle who is headed for Emerald Isle, Pine Knoll Shores, Atlantic Beach, Beaufort, Ocracoke, or Hatteras passes within thirty yards of Wilber’s front door. Most of the fighter jets at nearby Seymour Johnson Air Force Base also pass pretty close overhead, since the restaurant is squarely beneath the landing pattern. On more than one occasion after stepping out of my car in Wilber’s parking lot, I’ve been startled out of my wits by a positively ground-shaking, screaming blast from some swept-wing fighter hurtling from out of nowhere directly over my head, a few hundred feet off the ground. For many years, Wilber’s has had the same homey, laid-back feel: redbrick and white trim on the outside, knotty-pine paneling and red-checked tablecloths inside. A lunch counter and take-out area are in the center of the sprawling building, with tables to the right and left. Big, open dining rooms are located at both ends, allowing Wilber to seat more than three hundred at peak periods. Plaques in the foyer proclaiming “South’s Best Barbecue” and framed book excerpts and magazine articles hanging inside the restaurant provide quiet testimony to the reputation Wilber Shirley has built among barbecue aficionados not only in North Carolina, but also across the country. However, that reputation wasn’t made inside the restaurant — which is, frankly, pretty ordinary looking. It came as the result of endless hours — long, slow, middle-of-the-night hours — at the barbecue pits behind the main building. 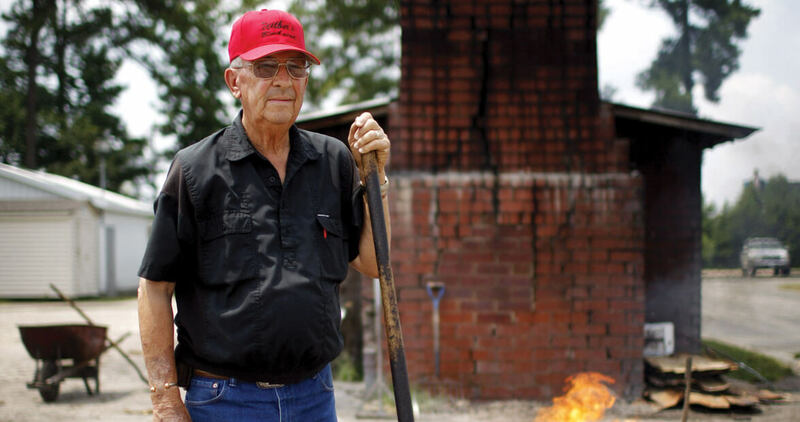 The man who put in a great many of those hours was the late Ike Green, a patient, affable man who cooked pigs for Wilber Shirley for more than thirty years before he passed away. Green’s domain encompassed a hundred-foot woodpile; an open-air fireplace with a straight, wooden chair pulled up beside it; and a long, cinder-block building with hip-high, open pits running the length of each side. Each evening, just a hundred yards or so from the eighteen-wheelers roaring up and down U.S. Highway 70, Green would build a fire of stacked oak logs in the fireplace. He let the fire burn down to coals for an hour or so as he trundled a wheelbarrow between the pit house and the restaurant building, loading the forty or fifty half-pigs he would cook that night onto the pits, where they would slow-roast for nine hours. Fortunately for Wilber’s, other faithful men have stepped up in the years since Green died to keep the fires alive during the long nights. But there’s little question that finding such workers is becoming increasingly difficult. Wilber Shirley himself is no slouch when it comes to hard work. He’s usually at the restaurant twelve or thirteen hours a day, six days a week. But he says that after all his years of owning the place (and several years of working for the former Griffin’s Barbecue in Goldsboro before that), he still loves coming in every morning. He has a son-in-law who’s been with the business for many years now, so he’s confident the operation will remain in family hands. In any case, since you never know what’s going to happen, I advise you to enjoy Wilber’s tender, juicy, wood-smoked barbecue while you can, and for as long as you can.